← How to Find the Fat in My Manuscript? Quick check-in to note something positive: I’m still in this! My writing is still getting done, albeit slowly, and every day I inch closer to my goal of a manuscript that (hopefully) won’t burn a beta-reader’s eyes right out of their sockets. I’m finding it a lot easier to keep up the habit when I make writing the first thing I do in a day. When I sit down to work, first off I open up my writing and edit a few pages. After that, more tea or coffee, and then work emails, but it feels good knowing that I’ve incrementally advanced the thing I really love doing. Then, because it’s already done, no amount of workplace crunch or late-night catch-up efforts can rob me of the time to write. Oh, and I’ve worked out a neat way to cut down my original manuscript using the long synopsis: rather than edit the old manuscript to match the synopsis changes, I’m pasting “keepers” from the manuscript into the synopsis: good bits of writing that match the simplified plot; good bits of dialogue that are still part of the main story arc… Embellishments that add to the story go in, and ones that don’t get left out. It’s like this – I don’t have to wield the chainsaw, rather I’m picking up the trees I want and putting them into a new garden. Sure, there’s work to be done rewriting the in-between parts, but in many cases everything I need is in the original manuscript, and it just needs a slight re-working. Other times I can just flesh out the synopsis text a little. It’s a big elephant of a task, but as my highschool P.E. teacher told me: that’s how you eat an elephant – one bite at a time. 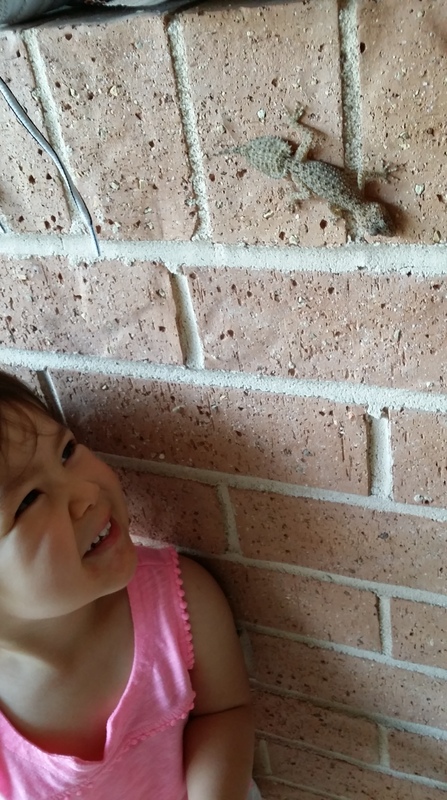 Now on a completely unrelated note, here’s a toddler with a gecko. That’s me for now. PEACE. This entry was posted in Archery, Childrearing, DIY, Writing and tagged editing, fiction, goals, manuscript, Writing. Bookmark the permalink.